Introducing the concept of Agile Tactics, and a practice called Focus Mapping. AgileByExample 2017 invited me to Warsaw to talk about my experiences with leading and being a part of agile transformations from over 15 years. 30 minutes is a good timeframe where you may not ramble too much, yet not risk dumbing down the subject as with lightning talks. At first, I wanted to talk about the anti-patterns of agile today. Yes, I’m introverted, and I prefer to ponder things before I answer. Brainstorming is fun, but I find it more energizing to plunge into a problem myself first, only to discuss different ways forward later with others. But I opted for a different topic this time. I chose to present my view on the different time spans in an agile organization, and a practice I’ve used for several years to close the gaps between hierarchy levels and roles in a typical organization. In this first installment, I will explain how and why I created Focus Mapping, and in the second part I will describe the actual session in more detail, and how I facilitate it. In the late 2000’s, I encountered several situations where a huge disconnect between the long-term strategic planning and the teams sprint planning existed, often impeding effective work. No real attention was being paid to ways for bringing these closer together. Instead, alignment was deferred to the product owner, who would use things such as scrum of scrums to align efforts. I experimented with adding on a forecasting event to sprint planning, and most times, three months turned out to be a good starting point. Also, I found skilled individuals who needed to operate between teams and over multiple sprints, to use their expertise in the best way. Teams should do this. Not product owners, project leaders, or even worse, ScrumMasters. The result needs to illustrate how teams perceive they need to spend their focus (or capacity) to reach goals, not the goals themselves. Hence, I chose the name Focus Mapping for the session itself, and Focus Map for the resulting map which becomes a forecast of how teams will need to interact and focus their efforts over the upcoming months. I started referring to the long-term forecasting and decision-making as the strategic level, the team's daily and sprint planning as the operational level, and the new three-month forecast thus became the tactical level. I suggest that the agile tactical level is a fairly new idea and used to only exist as story hierarchies on the product backlog. The tactical level visualizes design decisions, dependencies and effort management up to three months ahead. It provides a common playfield for business owners and teams to meet when discussing progress and capacity tradeoffs and offers a space for people operating on a tactical timeframe. Teams and stakeholders meet on the tactical level to agree on how they will spend their upcoming focus and capacity to reach the overall goals. They coordinate and resolve dependencies, and make tactical judgements and decisions to create realistic forecasts. Visualizing the tactical level also makes it easier to add advanced project management techniques such as Critical Path and Critical Chain if needed. The tactical level provides a natural place to integrate multiple ways of working. Some teams may use Kanban, others Scrum or a mix of both, yet another team use waterfall, because they have close to no variability in their work. Some teams estimate in points, others in days and hours. They can all integrate their respective cadences and forecasting methods on the tactical level. To forecast their work, teams need strategic items of a size they can pull into a tactical forecast. 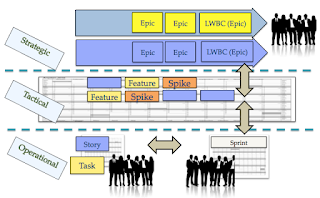 Epics can often be estimated, but prove difficult to plan. They need to be refined to a level where they can be pulled into the forecast. This rewards continuous preparation and refinement, which often result in research or pre-planning events being forecasted to refine and increase our understanding of certain epics. This may surprise you, but by engaging together in an envoy to map out dependencies and efforts, the environment each layer has to operate in becomes visible to each other. The effects may be surprising, and memorable. When agile teams realize to their horror that the strategic business environment is being based on the concept of waterfall - what do you do? In fact, I've experienced this several times. When discussing this for the first time, a few people argued I ”reinforced traditional hierarchy”. Now, I have nothing against hierarchy per se, but it's important to understand that the three levels I describe should not be confused with people hierarchy - these are three different levels of time perspectives, and teams and individuals may operate on one or several of these levels as needed. Some thrive in the operational level, making agile adjustments and navigating fast decisions. Others are invested in the long-term strategy and where the business is moving. Some work in teams but help with decisions on every level due to their interest and understanding of the entire business, etc. Release Train Planning often creates a board of achievements. Focus Mapping creates a board of focus areas. LESS basically just says ”throw more Scrum at the problem”. So I have found no evidence suggesting this practice would not work with either framework. Remember: Methods are not as important as the behaviors they reward. If someone tells you otherwise, you need to find a different (agile) coach. We are in a realm where no single best practice, but several good practices exist. Try, inspect and adapt. But… adding more planning still doesn't sound agile? A few people suggested this looks like you would lapse back into waterfall, big planning up front type of work. If you would detail all work over three months, we would create potential waste. But to add as little overhead as possible, we project the larger items on the later iterations, visualizing and dealing with the capacity and dependency demands they seem to instill. I provide smaller physical planning size on the boards for the upcoming months compared to the current month which always seems to do the trick. Also, we use the term “forecasting” to emphasize that this is our idea on how we might have to organize work in a month or two, but it's likely to change! Why not remove the levels completely? I suspect the Holacracy crowd has left by now, but if you’re still around, hear me out. You will still have to make decisions, assumptions and forecasts that span over multiple time periods in most organizations, and it doesn’t matter how you are organized. Focus Mapping brings people together to figure out how to deal with upcoming challenges. It does not matter how you are organized, although if your organization forbids people from working with decisions and forecasts on multiple levels, you will be less agile. Also, if people often bring up a similar need, why not address it? Perhaps this leads to new ways of collaborating.